When is it time to make a decision how do you do it? Flip a coin. Do Eeny Meeny Miney Moe? There are different ways you can make a decision and with this week talking about making a choice. It is good to have a tool or two that will help you make an educated decision. We know leaving it up to chance is not a good way to make a choice. Though you have a 50/50 chance to win out. Yet if I know anything about luck and chance, the more important the decision left to chance fate will deal a little mischief to your day. Therefore this week I have 4 links that help you make decisions. From a matrix to come out of the box ways to improve your decision-making process. The Pugh Matrix is one of the best ways to weigh the pros and the cons against a big decision. What you do is, lay out the factors that influence your decision. Then you lay out your choices. You then scale those choices based on the different factors. After you have made all the weights you then add everything together and the highest score wins. Reinhardt Gallowitz, who wrote the post, lays it all out for you to see. He goes step by step to show you how the Pugh Matrix works. I have incorporated this a few times. The results definitely pointed me in the right direction. Now the next site I want to share is by none other than Merlin Mann. He provided you with 8 tools to help you decide. He talks about the 80/20 rule where you get 80% of your results from 20% of your work. This is a concept that I am still trying to wrap my head around. But I hear so many people talk about how well it works. I just need to figure out how to look for the 20%. Merlin also talks about decision trees or some people call them to mind maps. These are inventive ways to get into your mind so you can lay out all the possibilities that lay ahead of you in a decision. Then there is the PMI which is the Pugh Matrix but then there is an interesting one called the Forcefield Analysis. This is a combination of Pugh matrix with the scoring and a paired comparison. interesting way to approach the problem at hand. Now this one is a little more out of the fun angle. They are unusual ways you can make a decision. Yet it has some truth to how they make the decisions. Like using a coin toss. 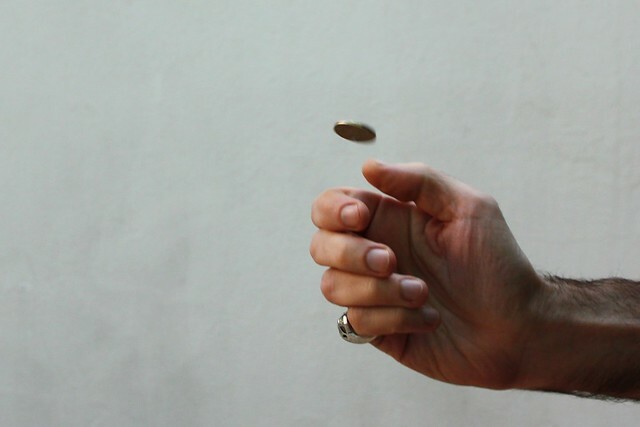 the reason why is because when you toss the coin in the air by the time you catch it you have made up your mind. It is sort of like the first thing to comes to your mind. You already know what you want and your decision is often clouded by doubt and the coin toss clears out the doubt. They also have fun with the magic 8-ball so don’t tell anybody that you made a huge corporate decision on the Magic 8-ball if you use that technique. Alex Honeysett does a great job of helping you make a decision through different layers. 8 layers to be exact. That way as you progress through the different factors your decision becomes more and more solid. From laying out the old reliable Pros/Cons list to using and listening to your intuition. Alex also talks about seeking counsel and using your mastermind to flesh out the different possibilities. So read her work it is very insightful and I learned a thing or two.